Deadline to file 2019 protest is May 15th or 30 days from Notice date! Online Protest is available until midnight of your protest deadline. 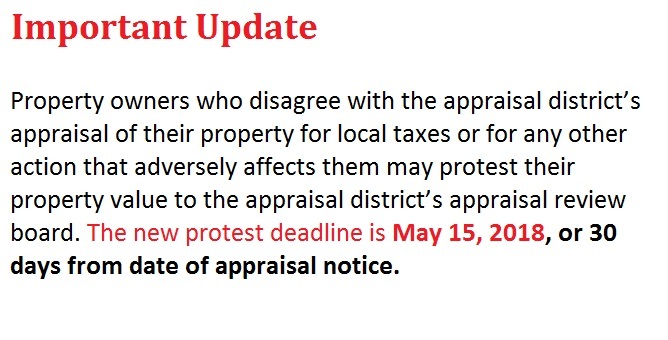 Please refer to your appraisal notice for your deadline. If you file a late protest you will need to submit a letter stating your reason for filing late. If it is due to technical issues with the online portal please include dates that you attempted to efile, if you emailed or called the district provide your phone number or email address that you used when attempting to get help. McLennan County Appraisal District (McCAD) is a political subdivision of the State of Texas. 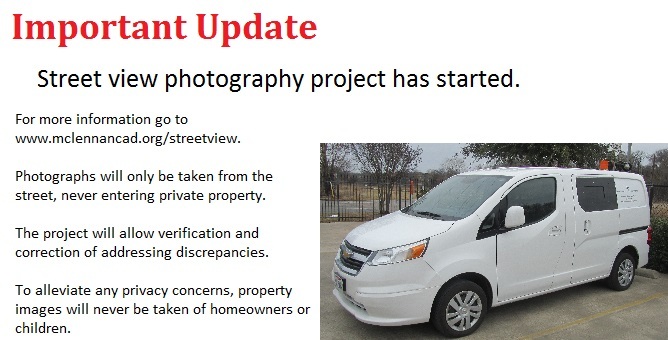 The District is responsible for appraising all real and business personal property for 44 taxing entities in McLennan County and surrounding counties according to the Texas Property Tax Code and the Uniform Standards of Professional Appraisal Practices (USPAP). Our staff is dedicated to providing professional service and ad valorem property valuation that is fair and equal. This website is provided for the convenience of the taxpayers within the District as well as those searching for online access to information and functions of McCAD. Within this site you will find general information about the District, the property tax system in Texas, and information regarding specific properties within McCAD. McCAD provides this information without warranty of any kind and is not responsible for any errors or omissions. Our mission is to courteously and efficiently serve the property owners and taxing entities (cities, schools, county and special districts) of McLennan County by timely producing an accurate, complete, and equitable appraisal roll.